A required Resource was not available. The problem occurs intermittently and only during an interactive SAS session. It does not happen in batch mode. To resolve this issue, follow the steps below to apply the hot fix and then set the Windows environment variable SAS_USE_THREAD_SAFE_MEMORY to 1. Step 1: Apply a SAS hot fix. Step 2: Set the system environment variable SAS_USE_THREAD_SAFE_MEMORY=1. Right-click My Computer or Computer and select Properties. Click Advanced system settings to open the System Properties dialog box. 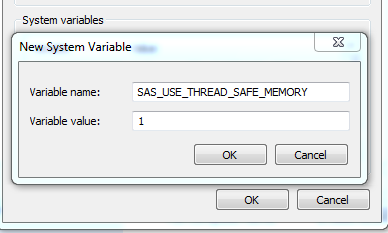 In the Variable name field, enter SAS_USE_THREAD_SAFE_MEMORY, and in the Variable value field, enter 1. The hot fix adds serialization so that when you are in interactive SAS, only one thread can access the resource at a time. This serialization might cause a slight decrease in performance. This should not be noticeable. If the serialization causes a problem, you can turn it off by setting SAS_USE_THREAD_SAFE_MEMORY=0. Display Manager SAS shuts down at what appears to be random times, and a Windows pop-up message says "sas.exe has stopped working." This is caused by a memory corruption that occurs when two threads access the same resources as the same time.